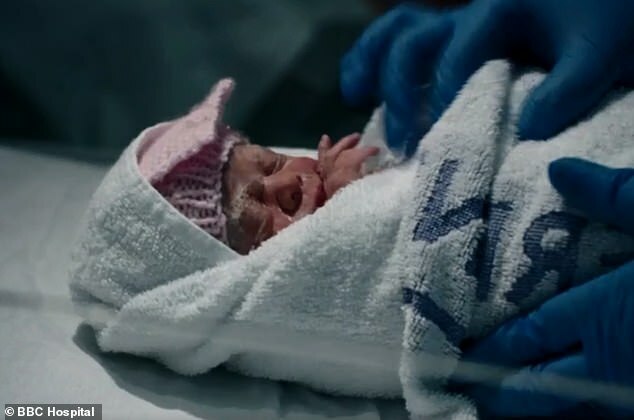 Viewers watching last night's episode of Hospital on BBC Two praised a pregnant cancer patient's bravery and heaped tributes on staff in a women's hospital. The programme's third episode followed staff and patients at Liverpool Women's Hospital as it continues to show behind the scenes of the city's NHS. One woman, known only as Kate, was dealt a bombshell diagnosis while pregnant, when she was told her breast cancer had returned and spread to her bones. On Twitter, people watching the moving documentary called the mother 'brave and inspiring', 'incredible' and said they were left in tears at the story. 'Tonight we witnessed how powerful a mother's love can be,' one added. Kate, already a mother to one daughter, had a double mastectomy years earlier to get rid of breast cancer which struck while she was in her 20s in 2008. Now 10 years since she was first diagnosed, Kate had waited more than five years to start the family she and her husband, Glen, wanted so she could finish a course of drugs to prevent the cancer returning. Having already had one child, Kate was expecting her second daughter when she was told the cancer had returned. Doctors don't know how long the now mother-of-two has left to live. 'How brave is Kate and her family – nothing but admiration for them,' Twitter user Mel said. Amanda Smith said: 'These people are strangers to me and yet my emotions are totally shot with what Kate is going through. Juliet McKee said: 'Tonight we witnessed just how powerful a mother's love can be. I wish Kate and her family lots of love'. As well as praising Kate, viewers also spoke about their respect for the staff at the women's hospital, with other mothers who gave birth there tweeting about it. And Twitter user Emily said: 'My heart is bursting and breaking at the same time watching #Hospital ... So proud of all the doctors and staff in Liverpool'.